I only have one word for this image.....WOW!! Fantastic macro! Voted Image of the Month. Good Luck! Fantastic photograph, the color pops. Thank you very much. There are more of this series in my gallery. I'm not big on macro for macro's sake...but I love this. Great color, lighting.....art. Beautiful! Love the different textures you were able to capture. Nicely done. I am glad, you like my work, Jenny. This is such an amazing shot! I have shot this photo at home in our living room. The flower was part of a loral bouquet my wife got from me. So I used the opportunity to shoot some nice photos. This photo is part of a whole series of focus stacked pictures. It was in the late morning. This is an available light photo. The sun was shining in through the window. For me the perfect light. used my Nikon D800 with my 20 years old Nikon AF Micro 105mm/2.8. Of course I had to use a tripod (Gitzo) with a Novoflex Castel Cross focusing rack and an Arca tripod-head named D4 "FLIPLOCK".The bouquet was standing on the table. The sun was shining in, so I had no need for a flash light. 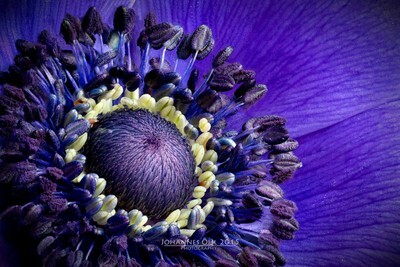 I have seen several focus stacked pictures of anemones here at Viewbug and on other communities. I tried to make it by my own, because I was fascinated by the processing. It was the first touch with focus stacking processing but definitely not my last one. On this specific photo I used the rule of thirds to make the photo more interesting. I have other photos of the same flower in my portfolio. Feel free to compare it with https://www.viewbug.com/photo/65151232. Focus stacking is all about post-processing. You have to shoot a series of pictures where only a small part of the photo is sharp. This sharp section of the photo is the only part you are using later on. I used photoshop to create the several masks with the sharp section and combine it to one single photo. Actually you see here about 30 photos in one. Luckily photoshop is doing the most work automatically. So it is not a big deal to combine them. After having one single picture I was working with the areas, which were not really sharp (around the pollen). I was able to repair this sections and voilá here is the result. The equipment is not as important as to have a good eye for a scenery. I have a Nikon D800 in my bag. My lenses are: Nikon 24mm/2.8 (20 years old), Nikon 50mm/1.8 (bought together with the body), AF-S 4,5-5,6/80-400 G ED VR (together with a teleconverter TC III) and my favorite Nikon AF Micro 105mm/2.8 which is also 20 years old and produces great photos. Often I use a tripod (Gitzo with Arca tripod-head named D4 "FLIPLOCK). Flash is rarly in use. I have a Metz flash. For macros I use a focusing rack by Novoflex (Castel Cross). Sometimes it looks very complicated to do something new. At the end it turns out, it was quite simple. I can only encourage you to try out focus stacked photos by your own. Most of the activities is done by the software itself. The shooting takes some time. To avoid vibrations (which are causing unsharp areas later) you should wait between each shot a short while that the equipment is in complete steadiness. Also you should not touch the camera when doing the shot. Use the timer or even better a remote trigger.